I have a problem with my USB flash drive. When I plug it in, Windows says 'USB device not recognized' and I can't see my files. Is there any way the data can be recovered? The system does not recognize the flash drive at all. If your USB flash drive suddenly "just stopped working" you may be able to fix it, or at least recover your data from it. It depends on whether the drive itself is physically damaged. Physical damage can include a bent USB connector that prevents the proper mating of the connectors on the flash drive and the computer. Insert the flash drive into the USB port and note any resistance, and whether the flash drive goes all the way into the USB port as it should. If you note any physical damage to the connectors you may be able to carefully bend them back into shape. If you find no external damage the flash drive or USB port may be damaged internally. But before you assume the damage lies inside your flash drive, try plugging it into another computer and see if it is recognized there. If so, the problem could be a damaged USB port on the other computer. Diagnosing and repairing internal damage to a flash drive or USB port is beyond most consumers' competence. Usually, the damage requires re-soldering of tiny connections; a novice is more likely to make things worse than better. If a visual inspection of a flash drive or USB port's circuitry reveals a break, you should take the device to a professional repair service. Non-physical damage can include a corrupted USB device driver, or a driver required by the specific flash drive you are using. 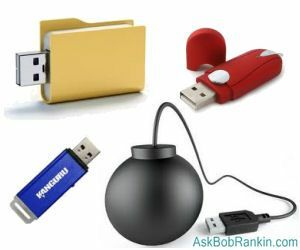 Download the latest versions of USB port and flash drive drivers from the manufacturers' support Web sites. Then remove the devices completely using the Device Manager module of Windows; this uninstalls the existing driver software. Finally, install the latest drivers and reboot with the flash drive plugged into the USB port. Windows Plug N Play should detect the port and install its driver, then detect the flash drive and install its driver software. If you are able to get the computer to recognize the flash drive but cannot read the files on the flash drive, then data recovery software may be of help. BadCopy Pro is an award-winning data recovery utility designed specifically for flash drives. If your computer can recognize the flash drive as a drive letter, then BadCopy Pro can recover data erased or corrupted due to media error, sector damage, accidental deletion, and even re-formatting. Disk Doctors Windows data recovery software can recover deleted and corrupted files. It can also make a disk image file of a flash drive: an exact duplicate of the bit patterns on the flash drive, stored on another drive. If there are physically defective sectors on the flash drive, it may be easier to recover data from the disk image than from the flash drive. For Mac users, the PHOTORECOVERY for Digital Media on Mac software is an excellent data recovery utility. Its name emphasizes recovery of photo image files, but it works with document, music, and any other type of file as well. If none of the above works, a professional data recovery service is your only viable option. (See my related article Hard Drive Recovery Services.) But they are expensive, so you'll have to decide how much the data on that flash drive is worth to you. Most recent comments on "Flash Drive Data Recovery"
Excellent advice on the Flash Drive, however I think you missed a golden chance to point out one of the major reasons for problems with your Flash Drive... use the "Eject" function or "safe Removal" BEFORE you hastily remove your drive... it's like failing to kiss your wife "good-bye in the morning.. it'll likely come back to haunt you that night! Both of these have worked for me when I rudely unplugged large external USB drives and the drives apparently became unusable. Sometimes the master boot record or the file partition table needs repair. It can be done quickly and simply so do not panic and reformat the drive unless absolutely all other options are exhausted. "you should take the device to a professional repair service"
http://flashdrivepros.com is the best one I could find. Here is my issue. Disk Doctor when I went to their site only talked about "disk" impling hard disk and did not mention FLASH Drives. BADCOPY PRO like all the other say, they have an "evaluation copy" but that usually means you can save a few to see if this thing really works before paying the $40. And after all the trouble of downloading, running and scanning, at the completion you get the surprise they WILL NOT let you see ANY of the files or save them until you pay the money. Hardly what I call a FREE TRIAL. And they seem to be restricted to video or pictures. Some of us have PDF, Word docs, etc on our flash drives.